The Sony RX100 Mark V is the fourth in a series of iterations of the original 1" compact camera Sony produced, the RX100. So you can see that Sony has tweaked this camera pretty much on a yearly basis since it first came out. Let's start with the base camera, the original RX100, and work our way upwards. The original RX100 followed shortly after the Nikon 1 appeared, with some similarities and a lot of differences. While the Nikon 1 was a small interchangeable lens camera with a 1" sensor, the Sony was a pocketable compact camera with a 1" sensor. Nikon started with phase-detect on the 10mp Aptina sensor, Sony started with contrast detect on a 20mp Sony sensor. Overall, the original RX100 was designed very much like traditional compact cameras were: a basic soap bar design (made of aluminum), minimal controls mostly situated around the Direction pad, composition provided by the big 3" LCD on the back. But it was a pretty full-featured compact that shot as high as 10 fps, all in a remarkable 8.5 ounce (240g) and pocketable package. The lens was a 28-100mm (equivalent) f/1.8-4.9. The Mark II added a tilting LCD, a powered hot shoe, NFC-enabled Wi-Fi, and some additional HD video modes. It also moved from front-side illumination to back-side in the sensor (BSI). The Mark III made quite a few changes: the sensor again was BSI, the lens changed to a 24-70mm (equivalent) f/1.8-2.8, a retractable EVF viewfinder was added, plus we got full sensor readout for video, XAVC S codec, uncompressed video over the HDMI port, and a built-in ND filter. The hot shoe disappeared, putting a small pop-up flash in its place. The Mark IV changed the sensor to a Stacked BSI design. This enabled 4K video, slow motion video capture, and much more. The EVF was upgraded to a higher resolution, S-Log2 gamma was added, shooting upped to 16 fps (fixed focus and metering), and electronic shutter was added. Which brings us to the current camera. As has been the case with previous iterations, there's a big emphasis on speed and function improvements. The big news is the addition of a very fast 315-point on-sensor phase detect autofocus system. Coupled with that is an increase in burst shooting speed to 24 fps, but now with full focus and metering. That's important for another reason: Sony doesn't provide a standalone charger with the RX100. Instead, you get a small AC widget that plugs into the USB port of the camera and charges the battery in camera. While convenient in a charging emergency, this shouldn't be your primary method of charging batteries for this camera, especially since you're likely to be using so many of them. I generally don't interrupt my reviews for what's essentially a commercial, as I just did, but trust me on this one: if you use the RX100 Mark V for any substantive shooting, you're going to be chewing through batteries, and you need a dedicated, multiple battery charging setup to keep up. You don't want to be without use of your camera while it's charging a battery back in your hotel room; that defeats the whole purpose of a pocketable camera. Note that all five RX100 models are still available for sale new here in the US. I'll deal with that in the final section of the review. The RX100 Mark V sells for US$999, and is made in China. Like a slippery bar of soap. First up, you absolutely have to buy the add-on grip or you're going to get frustrated. Here I go again dropping into a commercial in the middle of the review, but that's basically because Sony cut corners and costs in order to make this pocket rocket. Your thumb is going to want to slide off that slick front metal surface. The little rubber grip doesn't solve all the handling problems, but it does solve the one where you can't hold onto the camera well when it gets even slightly wet. That's slightly wet as in your own finger sweat. Between the optional front rubber grip and the small rubber pad where your right thumb usually will be, you can keep a solid hold of the camera. Your thumb will need to move in order to control anything while you're shooting. Thus, this remarkably small camera quickly becomes something you have to hold with two hands. The good news is that we have a lens ring that can be configured and used for various things (aperture, ISO, shutter speed, exposure compensation, manual focus). The bad news is that you have one lens ring and only one function at a time. Everything else is going to fall to the Direction pad and its ring, and to two relatively poorly placed configurable buttons. And that's the shame: inside there's that wonderful phase detect autofocus system. Can you control it decently? No. It's almost that your best bet is to leave the camera in one of the all-automatic focus modes, as the frustration of trying to control the focus yourself is just a bit overwhelming and slow. Possible, but not fun, and you could miss the shot. Meanwhile, the menu system is Sony's older one, with 28 pages of options that mix video and still options, use abbreviations and acronyms poorly, and with no useful help. Those of us who started with the original RX100 find all this mostly familiar—though the number of options has grown over time—and we can press, press, press our way to what we need to set. But boy would it be useful to have something better at this fifth iteration point. It strikes me that a well-implemented touch screen would solve so many handling problems. But it wouldn't solve my number one frustration with the RX100 models: the video button. I can't tell you how many times I've gone to do something with an RX100 and found that it was recording video. Recognize that, press the button to stop video, wait for the file to be complete, then do what I needed to; shot lost. So, please do this first thing after getting your RX100V: go to Setup Page 6 and set MOVIE button to Movie Mode Only. Unfortunately, that's not a perfect fix, as you'll now occasionally find your camera presenting the "Invalid in this Mode" message for which you have to press the OK button to proceed (or the shutter release, but you can't see what you'd be shooting due to the big message blocking everything else). In other words, no matter what you do, you have to press a button if you accidentally pressed the red video button. At least with the camera set right, you don't get random video files on your card. But still, solving a problem by just changing the characteristics of the problem isn't a solution, Sony. Meanwhile, the EVF issue has finally been addressed by Sony. You have to pull that little extension out when you pop up the EVF, which is a little annoying, but understandable considering how small the camera is and that you need some eye relief from the actual display. But the issue is this: push that extension back in and push the EVF into the camera body and at the default settings the camera turns off. Most of the time, that's not what I want to happen. And because it takes a couple of seconds for the camera to power cycle back on, that's potentially more missed shots. Fortunately, Sony finally added a “Function for VF close” item to page three of the SETUP menu that allows you to change this behavior. The tripod socket is off-center and immediately adjacent to the battery compartment door, making finding a plate that still allows you to get into the battery chamber difficult. And yes, I put a plate on mine because it allows for use of things like the Peak Designs CapturePro clip on my pack straps. Sadly, you'll probably be removing your plate to change batteries a lot. I suppose I ought to give credit to Sony for being consistent. If you've used any RX100 model, the current one will not handle differently. You have a few new options to set and play with, but that's about it. So once you get used to the RX100 idiosyncrasies, you're not going to be flummoxed by a big change buying a newer model. Battery: Even under the best of circumstances I rarely reach 300 images on a charge. Video recording is measured in minutes, not hours. But what do you expect? This is a very small camera and its uses a very small battery. I can't really ding the RX100 Mark V on battery performance. As I mentioned above, carry extras. I have a set of five and the extra four fit into the very small carrying case I use for my RX100 Mark V. Battery life isn't a matter of time, it's a matter of cost ;~). Fortunately, third party NP-BX1 batteries are inexpensive and work just fine in the camera. Cold weather might be a real problem for the RX100 Mark V, though. Even though it's spring here in Thomland, we had a bit of a cold snap as I was testing the camera, and my battery life dropped noticeably. Video: Here's the rub: the RX100 Mark V overheats in 4K mode and doing lots of slow motion work. How long you have until the heat detection system shuts the camera down depends upon ambient temperature to some degree. I've been able to run a couple of 5-minute 4K sequences in a row sometimes, and I've been unable to complete a single 5-minute 4K sequence at other times. The quality of the video that the RX100 Mark V produces is actually quite nice. The uncompressed stream is very clean and detailed, with very little rolling shutter, too. Sadly, you can't run it constantly for video due to the heat issues. The RX100 Mark V is a B-roll camera that you use infrequently, basically. Focus: No real complaints here. Single-focus users are going to be impressed with the speed at which the RX100 Mark V locks in. Continuous-focus users are going to pretty happy with how well tracking motion works now (really really good for a compact camera). The problem is as I noted above: controlling the focus. What I wouldn't do for a thumbstick right where my right thumb falls on the RX. In essence, focus performance now really depends upon whether you're in all automatic letting the camera choose or you're trying to put the focus sensor where you want it. The former is wicked fast, the latter can be torturously slow. Curiously, face detection worked on the face of a statue at wide angle (image below), but when I moved in—still with the face fully in frame—it didn't see it. That's the thing about face detection: when it works, it's wonderful; when it doesn't work, you're stuck doing the lifting. Eye detection was interesting. I would have guessed it to be more useful in AF-S mode, but it turns out to be more useful to me in AF-C. The difference is in how the camera "holds the eye" in AF-C versus not in AF-S, particularly considering you're holding a very small camera and may be wobbling a bit yourself. I've seen others write that they think the Sony has DSLR-like performance in AF-C mode. No, it doesn't. I find the "nail it" rate to be fairly low tracking real motion at speed, especially erratic motion. That said, like the Sony mirrorless cameras, the RX100 Mark V isn't generally far off in focus. It's that phase-followed-by-contrast-detect thing again, I suspect. You can't let the camera continuously run contrast detect after the phase detect phase moved the lens focus position, otherwise you'd likely have constant hunting. The small focus geometries here are part of the problem: phase detection alone may be slightly off, so the contrast step is added to try to improve the situation. But the faster and more erratic the motion, the more likely the contrast detect step didn't nail things for you. For more static subjects, however, Sony's system works great. Clearly Nikon is doing something different with their phase detect on the Nikon 1 cameras. I get somewhat better continuous focus sequences out of the Nikon J5 than the Sony RX100 Mark V. On the other hand, the Sony rarely misses by much, but the Nikon system, when it misses, it clearly misses. Image quality: Here's what I wrote in my RX100 Mark I/II review: "Be careful not to think of it as 20mp." Still true. Even though we've got a Zeiss lens out front, this is not the Zeiss lens of your dreams. Corners go soft and aberration-ny. The center doesn't seem quite as crisp as I'd expect, either. Don't get me wrong, the lens is good for a compact camera, but it's not what I tend to expect from Zeiss. When I run the RX100 Mark V against an APS-C camera, even the Canon EOS M5, there's a very night-and-day difference that's not explained by the missing 4mp on the RX100 Mark V. Some of this is the lens, some of this is a few missing pixels, some of this is Sony's JPEG processing. I wrote with the earlier models that I believed they performed like a 12-14mp camera, and I believe that to still be true, though more on the 14mp side now than it used to be on the original camera. Put a different way, I would be quite happy printing out to 13" on the long axis with the RX100 Mark V, but not the 18" that's implied by the pixel count. At 18" I'm starting to see the weakness in the sensor/lens, especially so at higher ISO values. But I guess that's the price to be paid for an otherwise solid camera that fits in my shirt pocket. This is where the Nikon 1 fans can rejoice a bit, actually. The Nikon J5, which uses a similar 1" 20mp sensor, does clearly better on my resolution test with a good lens mounted on it. There's more acuity on edges, and noise is handled ever so slightly better at the high ISO JPEGs. But then, even with the Nikkor 18mm lens, I can't fit a J5 in my shirt pocket. Not bad at all. Yes, there's some noise in there, but I've opened this up by at least three stops. The primary issue for me is again the slightly less than robust edges for this level of magnification. Overall, the Sony handles these high contrast scenes pretty well—I've only had to make minor adjustments to recover highlights from the raw file. But one thing I noticed in reviewing quite a few similar images is that the RX100 Mark V has a tendency towards modest underexposure when you throw such a wide range of tonality at it. Exposures are metered far better on lower contrast scenes. Nikon blew it with the DL cancellation. While the DL24-85 didn't have the built-in EVF of the Sony RX100 Mark V, it had more reach at the long end of the lens, a built-in grip, a hot shoe, and if it had performed like the J5, would have beat the Sony at autofocus and image quality. All at a lower price than Sony. Instead we're left with the Canon G7 X and the Panasonic LX10 as the primary RX100 competitors, and both those come out a little short in some things, slightly better in others. The Canon isn't as pocketable, doesn't have 4K or an EVF or as fast a focus, but it does have a lens that extends out to 100mm. The Panasonic doesn't have an EVF. Thus, it's not difficult to say that the Sony RX100 in its most recent form is holding serve in the totally-portable-but-competent camera game. You can't discount how that built-in EVF changes things, particularly in bright light conditions. The image quality is good enough, particularly because the focus performance is now excellent. So we have an old friend that's now better than before in a number of areas. Still as shirt-pocketable. Still with the same overall pluses and minuses. The question becomes whether or not it is worth the premium over the Canon and Panasonic offerings (or the other Sony offerings, see below). For the most part, I'd say yes. I wish the lens was a little better and Sony's JPEG handling were a little more refined. But in terms of performance-related items that's all I'd really want Sony to fix other than the basic control handling, particularly for focus control. But neither of the competitors really nail the control handling, either, though the Panasonic has an extra wheel, and two well positioned definable buttons. The touchscreen on the LX10 is a bonus, too. Still, it's hard to displace a classic, and Sony has pretty much defended their territory. But at US$1000, you're paying a premium for that handy EVF, fast focusing, and some really nice, but short, 4K video. RX100 — US$450. There's nothing wrong with this model. It's just slower and has slightly worse image quality then the subsequent models (about a 1/3 stop less dynamic range). It's the least flexible and connected of the bunch, and has the fewest video features. RX100 Mark II — US$600. I do like the BSI sensor a bit better, the hot shoe is useful and allows you to accessorize should you ever want to, plus the Wi-Fi, while not earth-shattering, is useful. But I'd probably buy the original or the III before this model at these prices. RX100 Mark III — US$700. The EVF is the thing that puts this on your buying list. But, it comes at the expense of a shorter telephoto focal length (70mm instead of 100mm). Don't let that distract you. The EVF is too handy and useful to ignore, which is why I don't suggest the Mark II model, because the EVF here is basically US$100. RX100 Mark IV — US$850. Okay, the first of the 4K versions, and that might attract you. But the video out of the V is better, the focus is better, the overall speed of the camera is better. RX100 Mark V — US$1000. If you want the best pocketable camera Sony has made, this is it. It's quite a powerhouse, with the only real drawback being user control: it's a compact camera design with a V8 engine in it. In essence, every other generation has proven to be useful to update to, which is sort of the norm with digital cameras IMHO. Even pros want a camera to carry around with them all the time that's better and more flexible than their smartphone. The Sony RX100 has filled that role for many of us for five years. The latest model keeps that tradition going. If you don't have another small, competent camera in your pocket for casual shooting, I think you need to consider the RX100. 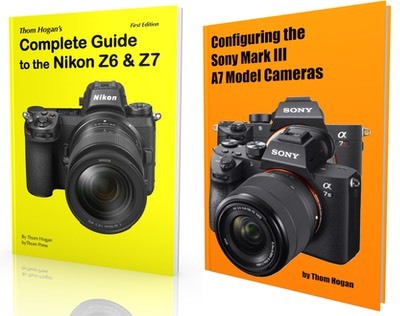 The Mark III model is sort of the sweet spot for still photographers, the Mark V for videographers or those who need the best focus performance in a compact camera. An earlier version of this review did not catch that Sony had added a function for fixing the EVF issue many of us complained about. That has been corrected in this version of the review.